An ultra-moist and completely delicious vanilla cake filled with tons of sprinkles filled creamy vanilla buttercream. The whole cake is enrobed in a silky Italian meringue buttercream and topped with a light pink ganache. This might be the prefect birthday cake, and yes this batter makes amazing funfetti cupcakes too! This cake is moist, delicious and triggers all of my childhood nostalgia! Why are confetti sprinkles so cute, yet so hard to find??? I had to MANUALLY remove all of the chocolate jimmies from a bag to make this cake. In the end, it was worth it. 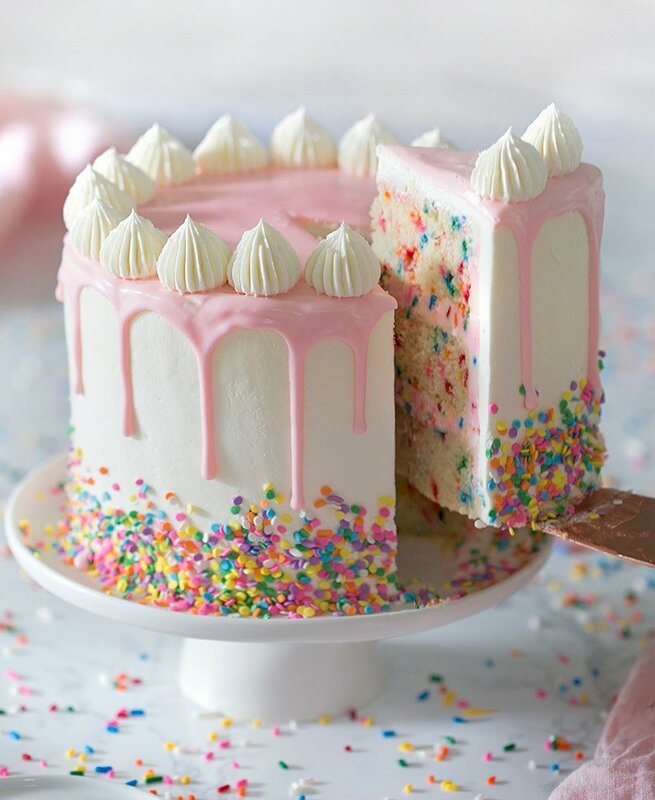 I love the color scheme and all the cute sprinkles on the bottom. 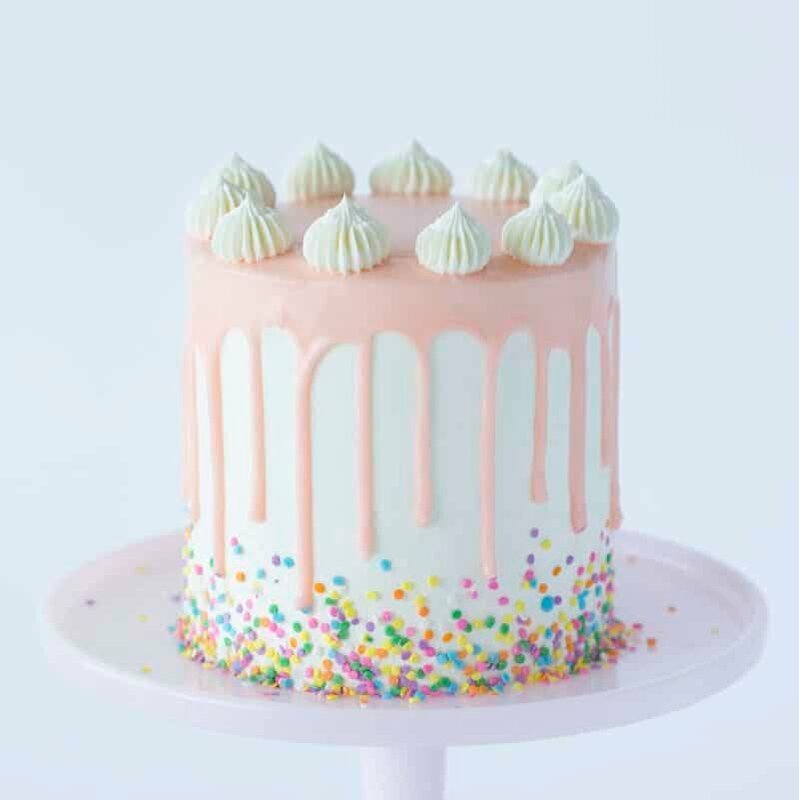 I know a lot of people are not into drip cakes but I love the soft pink crown on this cake! What do you think? Is funfetti cake white or yellow? 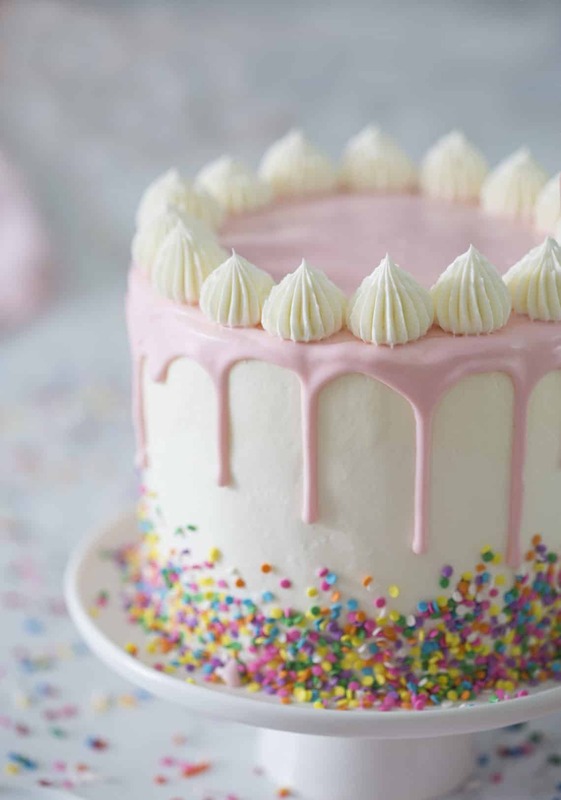 A classic funfetti cake is white. White cakes are made by omitting the yolks and adding another fat to replace the creaminess of the yolks. If you love a yellow cake feel free to make your own version, it will still be delicious! Can I put sprinkles in cake mix? You can add almost any kind of sprinkle to cake mix with excellent results. For this recipe I used rainbow jimmies on the inside and confetti sprinkles for the skirt. Non pariels however are not the best option as they bleed and dissolve quite easily. What do you need for funfetti cake? For a funfetti cake you’ll need a white cake batter, sprinkles and vanilla frosting. You can add extras like a colorful drip as I did or switch the flavorings up by adding almond extract or rose water instead of the vanilla. 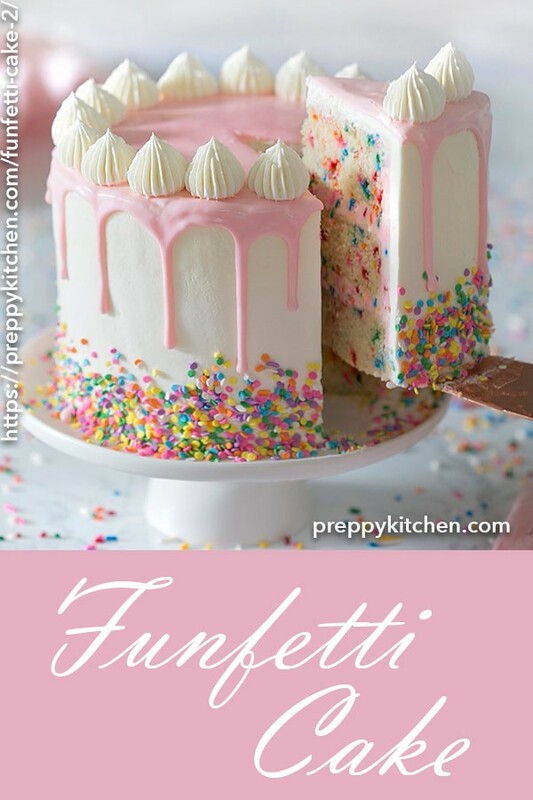 I love the recipe below as the cake is quite moist and delicious but many people use a classic white boxed cake mix for their funfetti cakes. How do you make Funfetti cake mix better? The best funfetti cakes are made from scratch with real butter and vanilla. Using store-bought cake mix and frosting is convenient but the trade off comes in the form of artificial ingredients and preservatives. If you’re not using 6-inch pans, double the recipe for 8-inch pans or triple the recipe for 9-inch pans. I’ve made this recipe quite a bit so I’d like to pass along some pointers: if you see little clumps of butter after you mix the wet ingredients don’t panic, it all works out by the time you mix in the dry ingredients. You can even use melted butter and warm the milk and sour cream up a bit if you like. If sour cream isn’t available you can substitute whole milk yogurt, I do it all the time and can’t really tell the difference. You can make the Italian meringue buttercream a day ahead, and leave it on the counter covered. Before you use it just give it a quick whip RIGHT before piping on as it looses it’s silky consistency quickly. You can check out my Italian buttercream post here for more tips and a full how to. To get FLAT layers that are moist inside and out try using cake strips! You can buy a set on the shop page or make your own from foil and paper towels at home. I made a whole blog post about it so check it out if you’re interested! Heat the cream up to just under a boil then pour over white chocolate and butter. You can play with the proportions on the ganache and use only cream and white chocolate if you desire as well. Allow to site for a couple units and then whisk until there are no lumps. You might have to pop it into the microwave for 20 seconds on half power if there are bits of unmelted chocolate. Add a drop of oil-based soft pink food coloring (I use AmeriColor soft gel food coloring). The color will lighten slightly when the ganache cools. If you’re using white chocolate be warned that water-based dyes will make the chocolate seize up! 1. Preheat oven to 340 degrees F. Butter and flour three 6-inch pans. I use cake strips on my pans for more even baking as well. Sift the dry ingredients together in a large bowl. 2. Beat the wet ingredients together in a medium bowl. 3. Add the wet to the dry and mix until just combined. Fold in sprinkles. Divide the mixture evenly into the cake pans. Bake at for about 30-35 minutes or until the centers are springy to the touch. 4. Beat the butter until light and fluffy. Add the confectioners’ sugar and cream and mix. Divide into 2 batches. 5. Add pink food coloring to one batch. Add sprinkles to both. Mix together. Transfer into 4 piping bags. Add a pink and a white to one piping bag and snip off the tip. 6. In a medium saucepan add 1 cup sugar and 1/3 cup water, then place on medium-low heat. Stir until sugar melts and becomes clear. Maintain at medium-high heat. 7. Beat the egg whites, salt and cream of tartar and slowly add in 1/3 cup of sugar. Continue beating until soft peaks form. When the kitchen thermometer reads 235-240F, drizzle the sugar into the mixer immediately. Run the mixer until meringue is cool/tepid. Switch to a paddle attachment. Add room temperature butter into running mixer one tablespoon piece at a time. Add vanilla. Beat until butter is combined and mixture has reached a silky consistency. Transfer to a piping bag. 8. Pipe the pink/white buttercream between each cake layer. Use the individual bags of pink and white to alternate a piped crumb coat. Smooth out with an offset spatula and scraper. Chill for about 10 minutes. 9. Pipe the Italian meringue buttercream on the outside of the cake and smooth out. I usually use an offset spatula for the top and a bench scraper for the side but you can improvise! 10. Chill for another 10 min. Add a skirt of confetti sprinkles to the bottom of the cake. 11. Melt candy melts, white chocolate and cream in the microwave until smooth. Add small amount of soft pink food coloring. Transfer to a piping bag. Add ganache to the top of the cake. Smooth to create a drip look. 12. Pipe dollops of Italian meringue buttercream around the edge with an 869 tip. 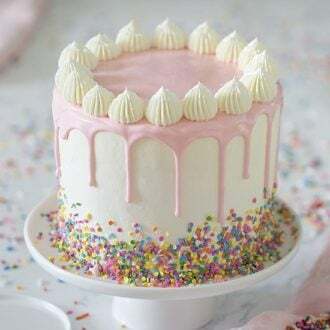 A moist and delightful vanilla cake filled with cheerful sprinkles, coated in creamy Italian buttercream and topped with a white chocolate ganache. Say hello to your new favorite cake! Might just be the cutest birthday cake ever! Preheat oven to 340 degrees F. Butter and flour three 6-inch pans. I use cake strips on my pans for more even baking as well. Sift the dry ingredients together in a large bowl. Sift the dry ingredients together in a large bowl. Add the wet to the dry and mix until just combined. Fold in the sprinkles at the very end and mix at little as possible. Pour the batter into the buttered and floured pans. Bake at 340 for about 30-35 minutes or until the centers are springy to the touch. In a stand mixer fitted with a whisk attachment, beat the room temperature egg whites, 2 dashes of cream of tartar, a dash of salt and 1/3 cup of sugar until soft peaks form. In a medium saucepan add 1 cup sugar and 1/3 cup water then place on low heat. Stir constantly until sugar melts and becomes clear. Maintain at medium high heat until temperature reads 235-240F. Drizzle the sugar into the mixer immediately. Run mixer until meringue is room temperature. Switch to a paddle attachment. Add room temperature butter into running mixer one piece at a time. Beat until butter is combined and mixture has reached a silky consistency. Add vanilla at this stage. Mix, then transfer to a piping bag. Beat the butter until light and fluffy. Add the confectioners' sugar, milk, vanilla and mix. Divide into 2 batches. Add pink food coloring to one batch. Mix until a desired color is reached. Fold in sprinkles to both. Transfer into 4 piping bags. Add a pink bag and a white bag to one piping bag and snip off the tip. Chop up the candy melts. Transfer to a bowl. Melt candy melts, white chocolate and cream in the microwave until smooth. Allow to sit for a couple of minutes and then whisk until there are no lumps. You might have to pop into the microwave for 20 seconds on half power if there are bits of unmelted chocolate. Add in a drop of pink food coloring (I use AmeriColor soft gel food coloring). The color will lighten slightly when the ganache cools. Transfer to a piping bag. Pipe the pink/white buttercream between each cake layer. Use the individual bags of pink and white to alternate a piped crumb coat. Smooth out with an offset spatula. Chill for about 10 minutes. Pipe the Italian meringue buttercream on the outside of the cake. Smooth out. Chill for another 10 min. 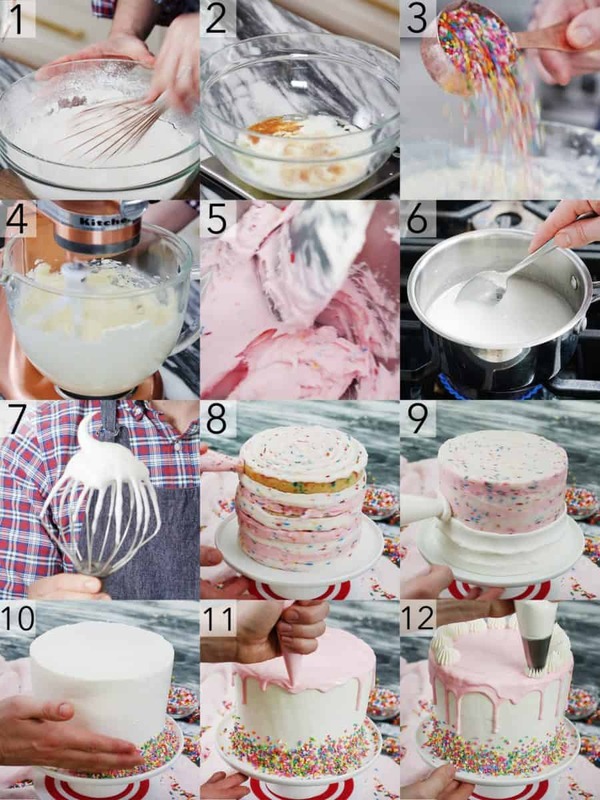 Add a skirt of confetti sprinkles to the bottom of the cake. Add ganache to the top of the cake. Smooth to create a drip look. Let the ganache cool. Pipe dollops of Italian meringue buttercream around the edge with an 869 tip. As an alternative to the candy melts for the ganache you can use all white chocolate instead. Melt about 1/2 cup of chopped white chocolate with 1/4 cup cream then stir in a very small amount of soft pink food GEL coloring, you can add more cream and heat slightly if the consistency is too thick. I often pipe a practice drip on some vertical parchment paper to gauge the consistency. Try to get a bar of white chocolate if you're doing this because the chips often melt with less ease and white chocolate is already a finicky. If sour cream isn't available you can substitute whole milk yogurt, I do it all the time and can't really tell the difference. You can make the Italian meringue buttercream a day ahead, and leave it on the counter covered. Before you use it just give it a quick whip RIGHT before piping on as it looses it's silky consistency quickly. To get FLAT layers that are moist inside and out try using cake strips! You can buy a set online or make your own from foil and paper towels at home. I made a so check it out if you're interested! I’m in the process of making this cake right now, and only had enough for 2 6 inch by 2 inch cake pans. How deep are the ones you use? Mine are 2 inches deep and I always have enough for 3 layers, they puff up a good deal in baking so I just divide the batter evenly. Wow. My daughter wanted a “sprinkle” cake for her 5th birthday and after searching for one, your video of this cake actually popped up on my Instagram feed. IM SO GLAD IT DID!!!! I am not usually a fan of white/yellow/vanilla cakes… But this one made me one today. I have never had Italian meringue buttercream and OMG!!!! It has changed me forever. It was so freaking good.. silky, smooth, buttery deliciousness. This cake was a hit with everyone. I doubled the cake recipe for the 8 inch pans as suggested but for the buttercreams I just stuck with the original recipe and still have some leftover. Well, actually I may have eaten the rest of the Italian meringue buttercream by itself 😂 Anyway, THANK YOU so much for this recipe. 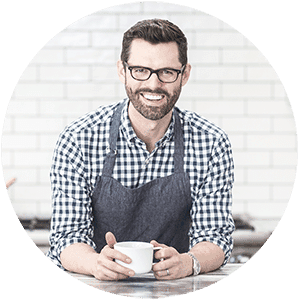 I look forward to trying more of your other recipes in the near future! It brings me joy to hear that you made this cake for your daughters birthday, and it was a hit! I have just recently discovered your channel, I like your videos they give very clear explanations. I am planning on making this cake for my sons 3rd Birthday. I am making it three days before. What is your advice on storing cake, to obtain optimal freshness? It can be refrigerated but needs to come back completely to room temp before serving. WOW such a beautiful cake! I’m making this for my daughter’s birthday- If I double the recipe, how much will I need to adjust the frosting and meringue recipes by? Thank you! If I use a 8 inch pan and I double the recipe with it make 2 layers or 3? Hello!I’m going to make this cake for my little girl’s first birthday and I would like to know where to keep it.The party is on Saturday and I’ll make the cake from Friday.I should put it in the fridge?